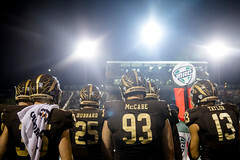 Western Michigan scored five second-half touchdowns to storm back from a 14-point halftime deficit on the road to overtake Bowling Green for the its fifth victory in a row after starting 0-2. The Broncos also improved to 3-0 in the Mid-American Conference with the win. Running backs Jamauri Bogan and LaVante Bellamy, along with a defense that allowed some yards but produced four turnovers, provided the ammunition for the Broncos rally. Bogan and Bellamy teamed up to rush for 220 of Western Michigan’s 283 yards on the ground. Bellamy chewed up the most yards and Bogan was the finisher for this unstoppable 1-2 punch. Bellamy had 111 of his season-high 145 yards in the second half when the Broncos put up 199 of their 283 yards on the ground. 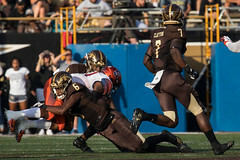 Bogan, who finished with 75 yards on 15 carries, scored four of WMU’s six touchdowns for the third four-touchdown performance of his career. The last time he rushed for four TDs in a game was in 2015 when Bogan was named MVP of the Bahamas Bowl. Western Michigan’s defense forced a pair of fumbles and had two interceptions. Both Bowling Green fumbles that the Broncos recovered were converted into touchdowns. Northwestern: Win No. 1 for the Wildcats at home in 2018 took a monumental comeback, as Northwestern had to rally from 10 points down with 5:41 remaining to force overtime at Ryan Field. QB Clayton Thorson engineered a 99-yard drive in the final 2 minutes to force OT and sophomore kicker Drew Luckenbaugh knocked home a 37-yard FG in extra time to win for the Wildcats. This was the second year in a row Northwestern has defeated Nebraska in overtime. Stony Brook: Sparked by a defense that scored two touchdowns on a 35-yard interception return by TJ Morrison and Shayne Lawless’ 54-yard fumble return, the Seawolves cruised to a road victory at New Hampshire. Sophomore DB Augie Contressa had a career-high 11 tackles, two sacks and forced the fumble that led to Lawless’ return for a touchdown. The two defensive touchdowns staked Stony Brook to a 21-0 lead before the second quarter was 2 minutes old. Maryland: Terrapins QB Kasim Hill tossed three touchdown passes and RB Ty Johnson ran for 132 yards to power the offense in an easy win over struggling Rutgers. It was the Maryland defense, though, that did the most damage by coming up with five interceptions and allowing only two completions in 17 attempts. The five picks was the most for the Terrapins since they recorded seven interceptions against Duke in 1998.
Colgate: The No. 17 ranked Raiders are undefeated and have a defense that literally can’t be scored on lately. The victory over central New York rival Cornell 31-0 marked the first shutout for Colgate in the series since 1919, and it came in the 100th meeting between the two squads. The Raiders are 6-0 and became the first Patriot League team to post three shutouts in one season. This was also the fifth consecutive game where Colgate’s defense has not surrendered a touchdown. Tyler Castillo capped the day by returning his 11th career interception 58 yards for the final Raiders touchdown. Fordham: The Rams went on the road and put up a season-high 43 points and 488 yards to subdue Lehigh and claim victory No. 1 for new head coach Joe Conlin. Back-up running back Tyriek Hopkins and Naim Mayfield took over for the injured starters and combined for 206 yards and three touchdowns. Penn: The Quakers struggled in the red zone, coming away with only 13 points after having first-and-goal five times against Columbia. But thanks to Penn’s defense limiting the Lions to fewer than 300 yards and Ryan Glover’s 4-yard touchdown run with 6:55 to play, the Quakers improved to 4-1 overall. Notre Dame: Trailing visiting Pitt by eight points at halftime, the undefeated Fighting Irish avoided the upset bid by the Panthers when QB Ian Book hooked up with Miles Boykin from 35 yards out with 5:43 to play that capped a 5-play, 80-yard scoring drive. Princeton: Forced to have Kevin Davidson make his first start at quarterback for the injured John Lovett, the junior had no problems guiding a well-oiled offensive machine. All-Ivy League wideouts Stephen Carlson and Jesper Horsted combined to catch 21 passes for 296 yards and three touchdowns against Brown. The Tigers are 5-0 for the first time in 12 years. This entry was posted in Colgate, Maryland, Northwestern, Notre Dame, Penn, Princeton, Rare Disease Awareness, Stony Brook, Uplifting Athletes, Western Michigan. Bookmark the permalink.